This is the smallest and lightest way to mount your WASPcam, while keeping it stables for images and video. Without having to shoot through the lens of a protective casing, it offers the purest shot. Consider combining the Camera Holder with a Tripod Mount for scenic outdoor life and sports. Designed specifically for diving, snorkeling or any underwater activity. Diving case is only available on 1080p30 recording, due to field of view angle. Waterproof up to 60 meters. Fasten this mount to the WASPcam and throw it on the water! Don’t stress, it floats. 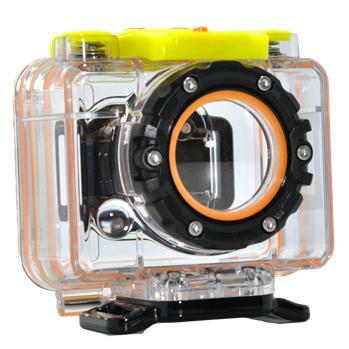 Every WASPcam 9900 and 9901 Action Sports Camera package comes standard with a Waterproof Camera Casing. This casing is waterproof down to 60 metres (190 feet) and attaches from either the bottom or back side, allowing for multiple camera angles. I know right … why I didn’t I think of that?! At WASPcam, we’re proud to stick out our chests and say we are the first action sports camera company to offer a protective lens cap AND it comes with the camera. Or you may purchase it separately if you lose yours. For conditions where water isn’t a factor, users may want to consider utilizing a Vented Camera Casing Backdoor. This backdoor does come standard with a WASPcam. Unlike the Waterproof Backdoor, the Vented version features 4 small vents to allow air and sound to pass through more easily. For those ‘awkward’ mounting situations, try using a WASPcam Velcro Strap. Secures a WASPcam 9900, 9901 or GIDEON (9902) to almost anywhere, and also connects WFD to camera. In some conditions, like sharp temperature changes, users may experience some fogging with the Waterproof Camera Cases. To combat this, we suggest inserting these Anti-Fog strips inside your case. Keep your WASPcam water tight with this Waterproof backdoor, which attaches to a Waterproof Camera Casing and Diving Case. It’s waterproof down to 60 metres (190 feet) and looks cool doing it. Keep your WASPcam camera, mounts and accessories safe and sound with this padded travel case. Includes custom-cutaway, interior foam padding designed to fit various WASPcam accessories and mounts. This waterproof plastic pouch works wonderfully for keeping your valuables dry during extreme sporting activities. Fits most cell phones, cash, debit cards, etc., and then fits snugly into your pocket. A waterproof camera casing designed for the GIDEON (9902) action-sports camera. This is included with every GIDEON camera package, but may be purchased separately. Includes waterproof backdoor (9960) and waterproof case adaptors (9961).